So you have decided to get a website for your business? Great. For many businesses today, having a website is almost an essential part of doing business in the 21st century, but unfortunately it can be tough trying to figure out what you want out of a website, and finding the right business to build it for you, at a reasonable price. Here at Cohesive IT Solutions, we love working with our clients to build them the website that shows off their business in a professional, and functional way. But there is more to building a website than just getting your hands on a Content Management System (CMS) like WordPress or Joomla, and hope for the best. If you are considering a website for your business, then here are some questions that I encourage you to think through, which will help you to get the website that best highlights your business, and helps you win more customers. Do you have an existing site you want to redesign or you need a new website? If you have an existing website, it is important to think through what is working well, and what isn’t working so well with the current site. This helps to develop the brief as to how the new website should solve the current problem that you are experiencing. It may just be that the current website is old and needs freshening up, or it might be that certain key aspects of it, such as the ecommerce system isn’t working as it should. When we develop a website, we want to know your business. We want the website we develop to be inline with your business. There is no point in us developing a professional website that we like, but which doesn’t communicate well what your business does, or suits the industry that you are in. So it is important that both you, and us, understand your business well. Thinking through your competitors is essential. Not only do your business practices and marketing efforts want to highlight how you are better than your competitors, but you need to also understand how their websites work. Do they have functionality that you like? How do they highlight the products or services that they provide? For some businesses, the website may just be a small promotional page which has contact details. Other businesses require a full ecommerce solution, with social media integration. 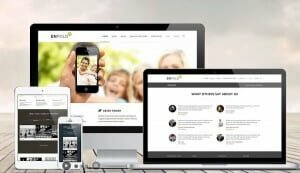 Having thought through some of the features that you require, can be a great help when discussing with any company that you want to build you your dream website. Why do you want a website? What do you want your website to accomplish? Whatever your business, you need to have realistic expectations about what you want your website to accomplish. Without knowing what your goals are, it makes it hard to develop a website proposal, and then know whether we have achieved the goal or not. Simply having a good looking website may not be your ultimate goal. Hang on… shouldn’t I be telling you the price of your website? Well yes and no. It is important for our customers to think through what budget they might have for the website. Sometimes it may not be achievable to fulfil the dreams of a customer at the low budget they may have, but thinking through this question is important. Research has shown that the average cost of a very basic WordPress website can cost around $4400-$5000. This may seem high, but there are 2 things to consider. Firstly, this is your online shop front. Many businesses spend a lot of money on quality shop fitting, to highlight their brand, and the website should do the same. Secondly, developing websites take time… a lot of it. That being said, here at Cohesive IT Solutions, we aim to develop professional websites that are more affordable. We want a quality website to be accessible for all businesses. What is your deadline for finishing the site? For some businesses, when you finally decide you need a website, often it can feel like you need it now. Other times a new website might link in with a whole marketing project, and a delay in a website also delays the rest of the business marketing. For simple websites, our goal is usually to deliver it within 1 month, but there are a variety of factors that can contribute to further delays, such as unclear expectations, and waiting on content. How are you going to promote the new site? Simply creating a website and hoping for the best generally doesn’t work. Further, simply having a website won’t turn your business into huge financial success. The success of a website is linked to the success of your marketing efforts. Whilst the websites we develop are search engine friendly, sometimes it is important to think through what other Search Engine Optimisation (SEO) strategies will be utilised to drive the most amount of customers to your website, similar to seeking a prime location for your shopfront. Are there websites do you like? If so, what are they and what do you like about them? When you are thinking through how you want your website to look and function, the best research you can do is to look look look. Look at as many websites as you can and take notes. Looking at other websites can help to inspire you and give you goals and directions. Is the content ready for your web site? The last question to think through is the content. Most website development relies upon the customer having written the relevant content to go on the website. We highly recommend you employ the services of a good copywriter in helping shape your content, but if budget is such that it doesn’t allow this, then we are able to help advise. Well we hope that these questions help you think through your next website. We would love the opportunity to design your website for you, so please contact us for the website you are dreaming of.